Warm days and cold nights signal plants to cease photosynthesis and begin breaking down the chorophyll pigment in their leaves to unmask other, colorful light-gathering pigments. Fall weather and decreasing day length signal animals to begin making preparations for winter — either storing food (like the squirrels have been doing) or eating like crazy to get fat enough to migrate south. Waves of warblers and other small songbirds have been moving through the Twin Cities recently, and some wind up in the backyard, looking for insects on late-blooming plants. Large flocks of Yellow-rumped Warblers move quickly through the vegetation, but occasionally stop to pose for a photo. Only a few species of perennial plants are still flowering here, like this Showy Goldenrod that is buzzing with several species of insects. Pollinators looking for a late autumn meal of nectar and/or pollen crowd onto a Showy Goldenrod plant that stands out in a field of Little Bluestem grass. In addition to the bumblebees, two species of hoverfly, a beetle, and a small wasp were foraging here. New England Aster was buzzing with Pink-edged Sulfur butterflies, bumblebees, and hoverflies. 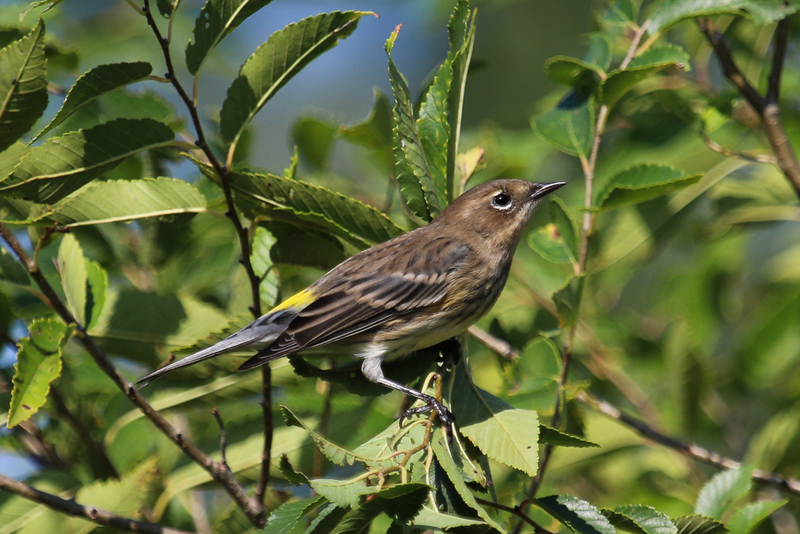 Seed-eating migrants might find a banquet waiting for them too, as perennial plants put forth their seed crops. 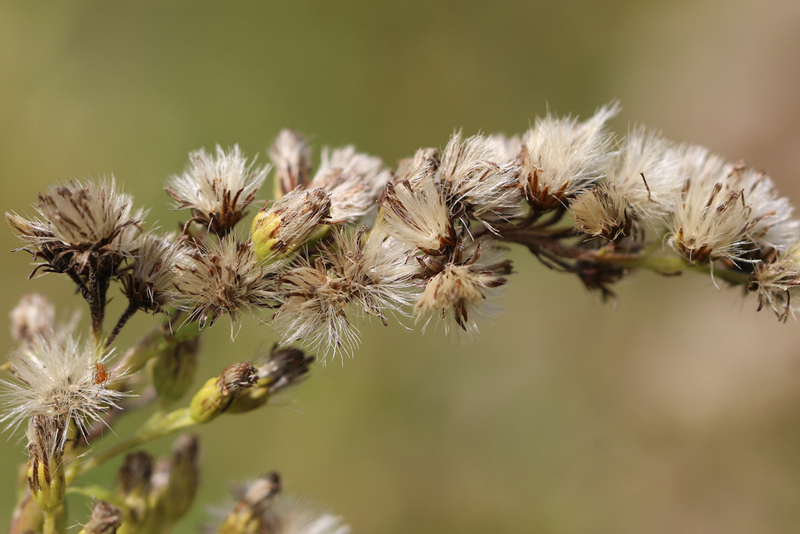 Canada Goldenrod seeds are buried in the wispy tendrils that help disperse the seed around the prairie. 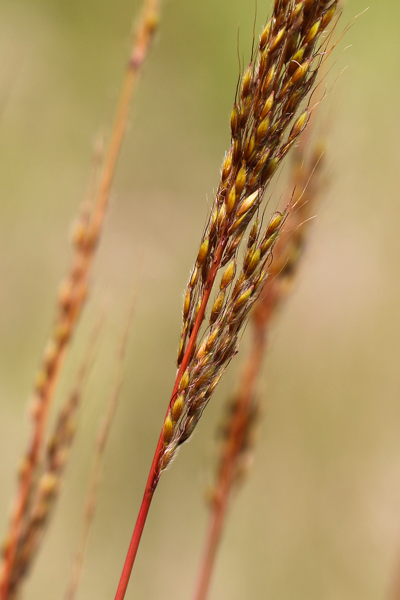 Perennial grass seeds are ripe for the taking as well. 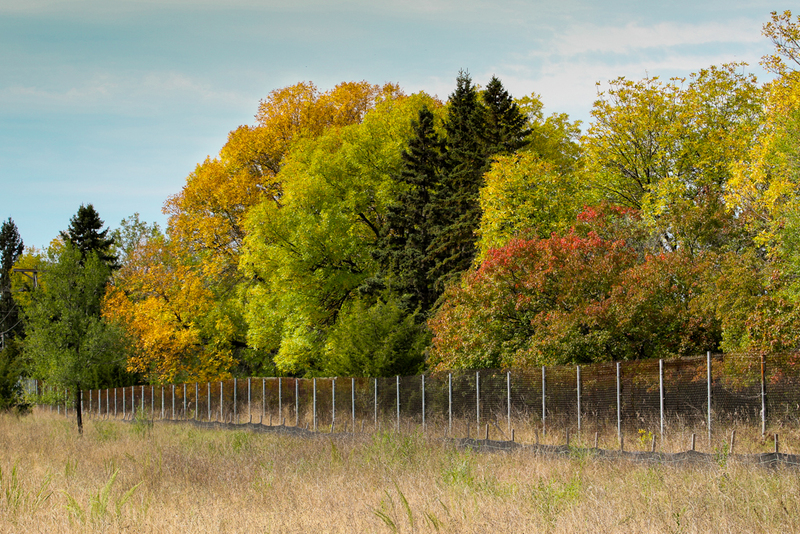 With all the rain late this summer, I hope this will be one of the most colorful fall seasons in recent years. But that depends on the day-night temperature differences in the next few weeks. So, stay tuned for more posts on fall color later. This entry was posted in Bees, Birds, Butterfly, fall, Insects, Landscape, Minnesota wildlife, Nature, Plants, Prairie, Wildlife Photography and tagged Canada Goldenrod, fall color, Indian grass, pink-edged sulfur butterfly, yellow rumped warbler by Sue. Bookmark the permalink. A nice collection of some seasonal changes and activity! Thanks, Monique. Glad you enjoyed it. Those Sulfurs can be hard to photograph – nice job! Thanks, Kathy. There are a lot of them around right now, and they are mobbing the asters, so lots of photo ops. You’re right Sue, our butterfly photos are nearly identical. You’ve got some beautiful colors there! Ours are just now beginning to pop. I can’t wait to see more fall colors, Sue. Here in Northern Virginia, our foliage colors are much more muted. 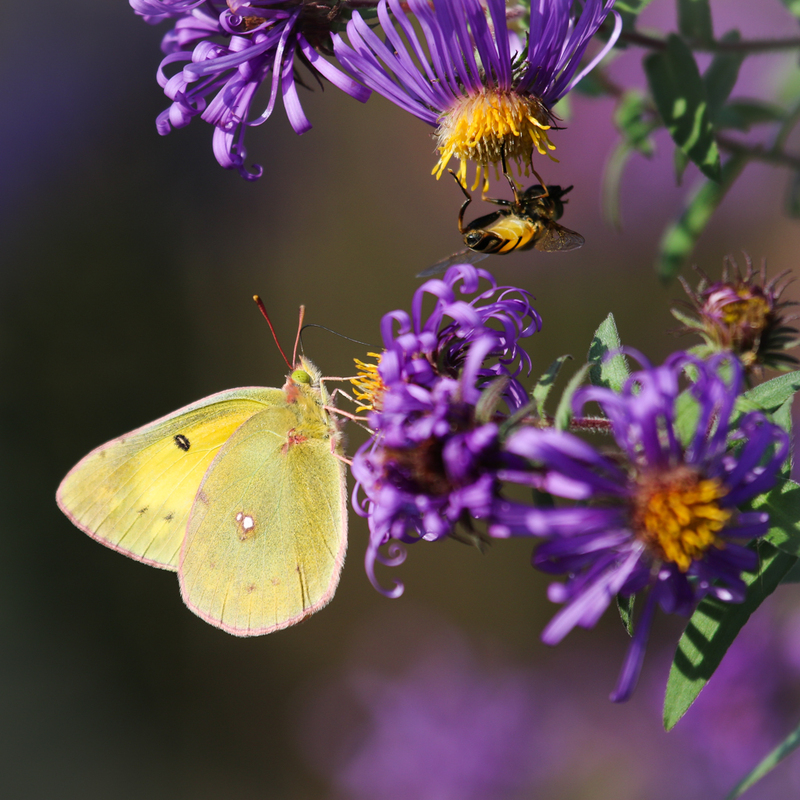 I love your shot of the Pink-edged Sulphur and the fact that you were able to capture the details that are responsible for the name–the pink accent of the butterfly and the purple of the flowers are a great combination. Thanks, Mike. I hope we get the right combination of weather to make that happen. 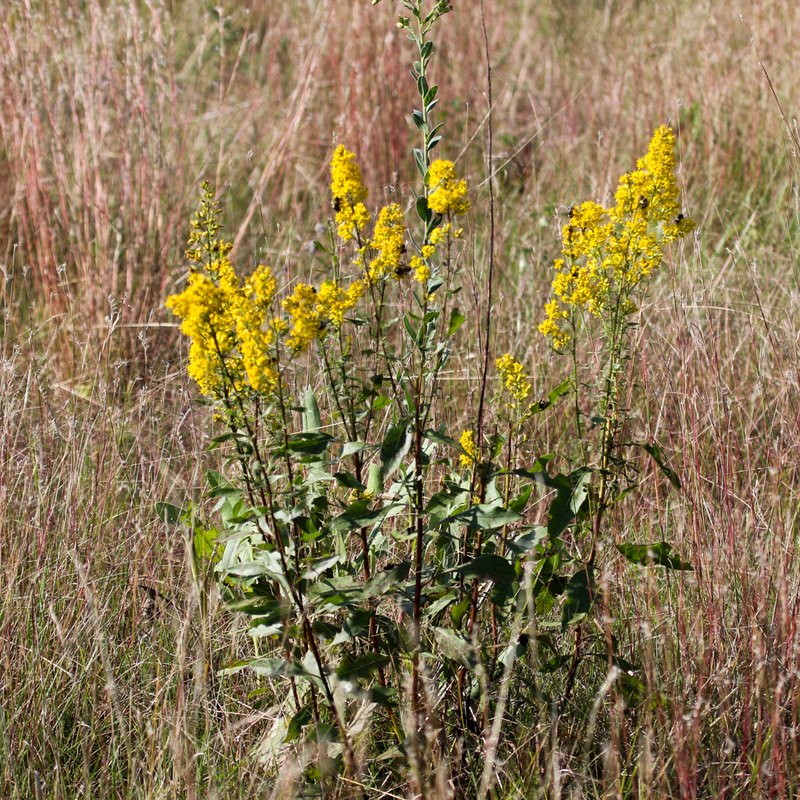 Do you have native Goldenrod — or is it an introduced species. 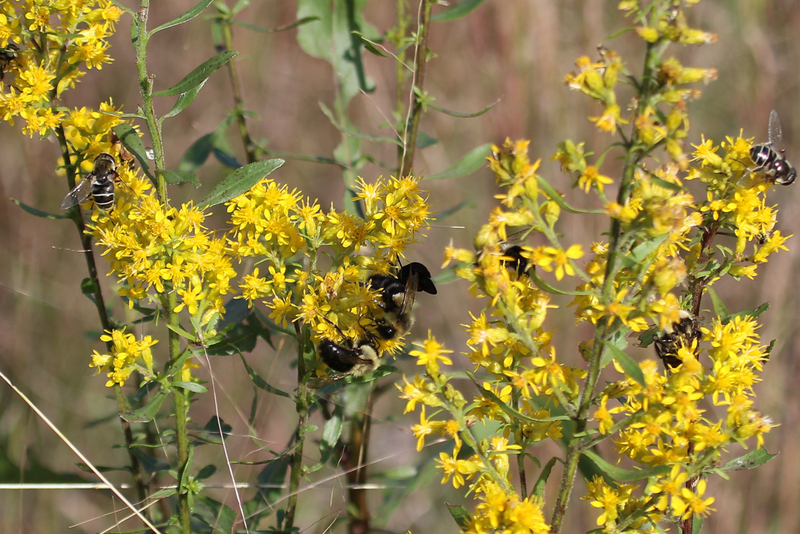 Bees might be very particular about their goldenrod :). It is an introduced garden plant and we don’t have a native variety. Bees are enticed by lots of nectar and pollen but it is amazing how this can vary in the garden species grown for their attractiveness to human gardeners.